In the Orthodox Church the custom was established, that on the day following the Great Feasts of the Lord and the Mother of God, would be remembered those saints who most essentially participated in whichever the sacred event. And thus, on the day following after the Theophany of the Lord, the Church honours he that participated directly in the Baptism of Christ, indeed placing his own hand upon the head of the Saviour. Saint John, the holy Forerunner and Baptist of the Lord, termed by our Lord the greatest of the prophets, both concludes the history of the Old Testament and opens up the epoch of the New Testament. The holy Prophet John gave witness concerning the arrival on earth of the Only-Begotten Son of God, incarnated humanly in the flesh. Saint John was deemed worthy to baptise Him in the waters of the Jordan and he was a witness of the Theophany or Manifestation of the MostHoly Trinity on the day of the Baptism of the Saviour. The holy Prophet John was a kinsman of the Lord on His mother's side, the son of the Priest Zachariah and Righteous Elizabeth. The holy Forerunner of the Lord, John, was born six months earlier than Christ Jesus. The Archangel Gabriel was the messenger of his birth, in the Jerusalem Temple revealing to his father, that for him a son was to be born. Through the prayers offered up beforehand, the child was filled with the Holy Spirit. Saint John prepared himself in the wilds of the desert for his great service by a strict life, by fasting, prayer and sympathy for the fate of God's people. At the age of about 30 years he came forth preaching repentance. He appeared at the banks of the Jordan, by his preaching to prepare the people for acceptance of the Saviour of the world. In the expression of churchly song, Saint John was a "bright morning star", whose gleaming outshone the shining of all the other stars, announcing the coming morning of the day of grace, illumined with the light of the spiritual Son, – our Lord Jesus Christ. Having baptised the sinless Lamb of God, Saint John soon died a martyr's death, beheaded by the sword on orders of king Herod in fulfilling the request of his daughter Salome. (About Saint John the Baptist, vide: Mt. 3: 1-16, 11: 1-19, 14: 1-12; Mk. 1: 2-8, 6: 14-29; Lk. 1: 5-25, 39‑80, 3: 1-20, 7: 18-35, 9: 7-9; Jn. 1: 19-34, 3: 22-26). The body of Saint John the Baptist was buried in the Samaritan city of Sebasteia. 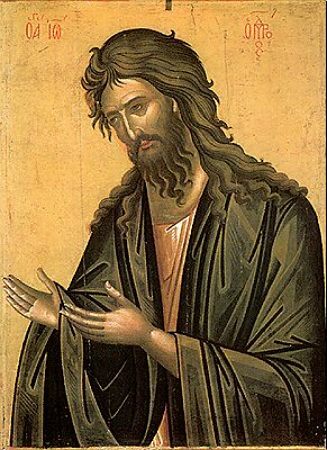 The holy Evangelist Luke, in making the rounds preaching Christ in various cities and towns, came in time to Sebasteia, where they gave over to him the right hand of the holy Prophet John, the very hand with which he had baptised the Saviour. The Evangelist Luke took it with him to his native city of Antioch. When the Mahometans centuries later seized possession of Antioch, a deacon named Job transported the holy hand of the Forerunner from Antioch to Chalcedon. From there, on the very eve of the Theophany of the Lord, it was transferred to Constantinople (956) and kept thereafter. In the year 1200 the Russian pilgrim Dobrynya – who was later to be come the holy Archbishop of Novgorod Antonii (Comm. 10 February), saw the right hand of the Forerunner in the imperial palaces. From the Acts of the Saints it is known, that in the year 1263 during the seizure of Constantinople by the Crusaders, the emperor Baldwin gave over one bone from the wrist of Saint John the Baptist to Ottonus de Cichon, who then gave it over to a Cistercian abbey in France. The right hand continued to be kept in Constantinople. And at the end of the XIV thru beginning XV Centuries the holy relic was seen at Constantinople in the Peribleptos monastery by the Russian pilgrims: Stefan Novgorodets, deacon Ignatii, the cantor Alexander and deacon Zosima. But with the capture of Constantinople by the Turks in 1453, sacred objects were gathered up at the whim of the conqueror and preserved in the imperial treasury, all locked up. In the Acts of the Saints is presented clear testimony, that in the year 1484 the right hand of the holy Forerunner was given away by the son of the Mahometan sultan Bayazet to the Rhodes knights to gain their good-will, since a dangerous rival for Bayazet – his own brother, had situated himself amongst them. And about this event there speaks also a contemporary participant, the Rhodes vice-chancellor Wilhelm Gaorsan Gallo. The Rhodes knights, having established their base on the island of Malta (in the Mediterranean Sea), then transferred to Malta the sacred relic they had received. When the Russian emperor Paul I (1796-1801) became grand-master of the Maltese Order in honour of the holy Prophet John, the right hand of the Baptist, part of the Life-Creating Cross and the Philermian Icon of the Mother of God were transferred in the year 1799 [because of the Napoleonic threat] from the island of Malta to Russia, to the chapel at Gatchina (Comm. 12 October). In the same year these sacred items were then transferred into the church in honour of the Saviour Icon Not-Made-by-Hand at the Winter palace. And for this feast was compiled a special service. Besides the Assemblage ("Sobor" or "Synaxis") of the venerable glorious Prophet, Forerunner and Baptist of the Lord, John, the Russian Orthodox Church celebrates his memory on the following days: 23 September – his Conception (2 B.C. ); 24 June – his Birth (1 B.C. ); 29 August – his Beheading (+ c. 32); 24 February – the First (IV) and Second (452) Finding of the Head; the Third Finding of the Head (c. 850); 12 October – the Transfer of the Right Hand from Malta to Gatchina (1799).